Scientists on the OPERA experiment announced last month that they had measured neutrinos traveling faster than the speed of light. Either this was the start of a revolution or the result of a systematic error. Being scientists, they assumed the latter and asked for help finding the glitch. Despite what some headlines have suggested, the question of whether the result is correct is still up in the air. Experimentalists have not been able to establish how the experiment is flawed, and yet theorists have not been able to determine how its conclusion could be true. 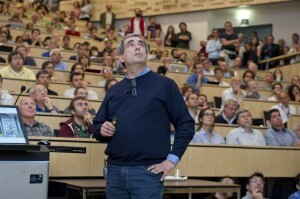 “There’s no model that explains it,” said CERN theorist Gian Giudice. Scientists have posted dozens upon dozens of reactions to the OPERA result on the arXiv, an open-source archive of scientific papers, since scientists announced it on Sept. 23. But each proposed explanation contradicts other established measurements in particle physics. Experimentalists could ease theorists’ minds if they could find a problem with the original measurement. Plenty of people have tried, said Antonio Ereditato, spokesperson for the OPERA experiment. “After our seminar when we requested collaboration, we got some 700 emails,” he said. 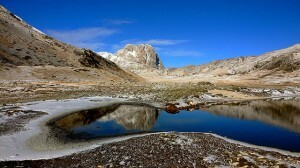 Gran Sasso in Italy. Image courtesy of Andrea Parisse through a Creative Commons license. People asked whether OPERA physicists had taken into account the rotation of the Earth, general relativity, continental drift and other factors that might affect their measurement. In response, the OPERA collaboration has explicitly calculated some of the effects they had originally argued would be negligible. Those trying to explain the OPERA result have quite a job to do in clearing up the difference between the measured speed of the neutrinos and the speed of light. OPERA will add these details to their scientific paper this month, addressing scientists’ queries but leaving open the question: If neutrinos cannot travel faster than light, what is causing this mistaken measurement? One challenge to the validity of the OPERA result that has received media attention recently stems from a theoretical paper by physicists Andrew Cohen and Sheldon Glashow, a Nobel laureate. Cohen and Glashow wrote that, if a neutrino were to surpass the speed of light, it would emit pairs of electrons and positrons, thus losing energy during flight. We see a similar effect when particles are able to outpace light while traveling through water. 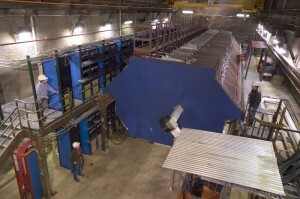 The OPERA experiment, in addition to a neighboring experiment, ICARUS, found several examples of neutrinos that managed to arrive at Gran Sasso with high levels of energy in tact, meaning that they had not lost electron-positron pairs as predicted during their journey. Scientists also did not detect stray electron-positron pairs coming from the traveling neutrinos. It seems the radiation Cohen and Glashow predicted did not occur. If Cohen and Glashow are right, the neutrinos traveling from CERN to Gran Sasso did not beat the cosmic speed limit. However, their prediction has not been proven experimentally, and in science, experimental results trump theoretical predictions. The scientific community’s best option seems to be waiting for a second opinion from the MINOS neutrino experiment at Fermilab. MINOS physicists will take a similar measurement next year after making an upgrade to their detector in December. They may be able to collect enough data before a long shutdown next summer. But if not, the scientists at OPERA and the rest of the world might need to wait more than a year for an answer. For now, the mystery remains, and the hunt for answers continues.